for example "18" Compo Shirley Temple", "Toni P91", or "Patsy Ann". I research each doll to find pictures of her original footwear and then I copy it in leather and in whatever size or color she needs. Shoes, boots, ice skates, skis, sandals, slippers - if a doll wore it, I'll copy it. Mates to old shoes and shoe repair, too! Renew an old wig or get a perfect replacement. Synthetic, Mohair, Human Hair, Chosen, Cut and Styled for your particular doll. 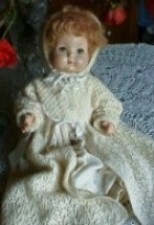 This Old Doll happily features links to some of the finest doll seamstresses on the web! If your special doll needs an outfit worthy of her, please check out the Dresses link in the Boutique! DEPARTMENTS To Enter Departments, Just Click on the Picture Icons, Please! Pictures of our dolls. These photos might help you identify or put a value on one of your dolls! A friend is confused and having problems telling her dolls apart. So I put up a quiz that might help her get some practice. If you'd like to try it, here's the link: QUIZ If you have a doll you'd like to share, please email a picture with your name and a note telling me what you know about it to michele@thisolddoll.com Subject: "gallery". Custom made shoes to match your doll's outfits, hats, purses, dresses, undies, replacement buckles, wigs and lots of items to make your doll look as close as possible to the way she looks in the reference books! 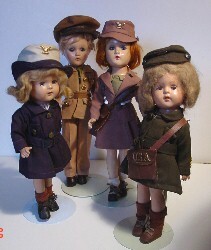 Most items that aren't vintage are hand-made replicas of items, listed by the dolls they belong to. So you won't need to know what size you need, just tell me what doll it's for and if I don't have it on hand, I'll make it! Have a question? Ask and I'll try to find an answer! Mail that might interest or ammuse others is posted here. Just send email michele@thisolddoll.com to subject: "Question". The Doctor is always in when you're the doctor! Pictured are some common problems. Click on the pictures to learn how to handle them. Links to the schedules from the UFDC and McMaster's web sites. TIME IS 10A.M. TILL 3 P.M. If there is a doll show or auction coming up in your area? Email michele@thisolddoll.com with a subject of "Happening" and I'll post it here. Be sure to tell me what, where, and when. I'm often asked what I use when I work on dolls. In the past I asked others the same question and was told it's a "trade secret". I hate that. One lady has been of immense help to me, Sandy at Toland's Dolls, in Ghent, Ohio. I don't always take her advice, but she's never failed to help when I asked her. A long time ago I learned we like "because" but we love "in spite of". Many of our dolls have imperfections that endear them to us, but if we could fix some of their problems ourselves, we would. Here, then are my "secrets." Here are some links to some great sites that I've found very helpful. If you have some you'd like to see added here, email michele@thisolddoll.com Subject: LINKS. Over the years I've accumulated a virtual library of Doll books. The popularity of these dolls has resulted in many new books that picture these wonderful dolls. If you haven't been able to identify your doll or want to know its curent value, the best resources are books. Find your doll in the books at your local public library. After you've identified it, you can go to a book store like Barnes and Noble or Border's Books and find it in a current price guide. Keep in mind that the values are for dolls in nearly mint condition and the value goes down fast if there are any flaws. Half the value of a doll is the original clothing. Because doll prices change so much and so quickly, the next step is to find on-line auctions that are selling your doll in played-with condition. This should give you an idea of what people would currently willing to pay for your doll, which is the true answer to, "What's it worth?"